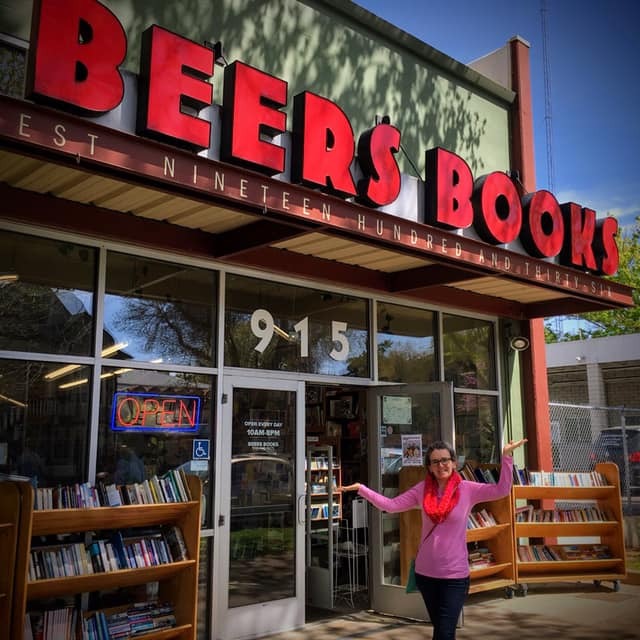 Captivated Reader: Beers Books in downtown Sacramento, California! Last weekend, my husband and I spent four days in Sacramento, California (Friday through Monday) to celebrate our 17th wedding anniversary. We had a blast checking out several tourist sights in the downtown area of Sacramento. Of course, in my opinion, no trip would be complete without visiting an independent bookstore. We visited Beers Books in downtown Sacramento, which sells both new and used books. They are open daily from 10am to 8pm. Beers Books started selling new and used books around 1936. So how did Beers Books get its unusual name? Many people often ask how old our shop is and wonder how we got our unusual name. In some form or another, Beers has been selling new and used books in Sacramento since about 1936. Through four different owners and several locations, it has evolved into its present incarnation at 915 “S” Street. The history of Beers Books began around 1936-37 when our namesake, Mrs. Nellie Beer, worked as a clerk for L.H. Mytinger Books at 1125 8th Street in Sacramento. Her name appears as one of the charter members of the Sacramento Book Collectors Club in 1939. At some point this store on 8th Street changed its name to "Beers Book Store," for we have a circular advertising books-for-sale under this name at this location. To read more about Beers Books history, check out their about page. I was impressed with how large the interior of Beers Books was during our visit! They have a good selection of books for sale and places to sit and read during one's visit. The staff members were warm and welcoming. I've had the goal of not buying books during the year of 2019 as I currently have way too many books to read! However, I could not resist buying three used paperback books for the grand total of $1.63! One of the books I purchased was Diane Ackerman's nonfiction book, A Natural History of the Senses. I loved reading Diane Ackerman's book The Zookeeper's Wife and have always wanted to read another one of her books since then. More bookish related posts from our trip to Sacramento to come. Until then, happy reading!! Great! I did not know about the book you bought. I loved The Zookeeper's Wife. What were the other two you bought? I also left with a copy of Endurance by astronaut Scott Kelly and a murder mystery novel titled, Murder On Safari by Elspeth Huxley. I like the grand total of your purchase. One has to love great deals when they are available! :-) Thanks for the info about the bookstore. I love great deals. I am a bargain hunter at heart!